The episode is available for download here. This week on Home Impodcast…Adam and Jordan discuss THE WORST EPISODE OF HOME IMPROVEMENT THEY’VE COVERED TO DATE, entitled “Future Shock.” Topics discussed include: A burgeoning beef with Country Living, why the Home Improvement cast fails at acting old, and routines. This week on Home Impodcast, the dudes tackle the first episode of season six, entitled “At Sea.” Topics discussed include: Al Borland’s LinkedIn page, the 1997 television landscape, and Street Fighter. In our short preview, we rank some of our best and worst episodes of The Twilight Zone as a whole. You can listen here. The full episode goes in-depth on Jack Elam’s performance, how scared of aliens we might be, and the time one of these actors showed up in Houghton Lake, Michigan. To get the full episode and bonus episodes each month, support us for $1 a month on Patreon. Thank you to all of you who already do. It means the world to us. On the season finale of Home Impodcast, Adam and Jordan discuss Games, Flames & Automobiles. Topics discussed include: our personal television Mt. Rushmore, aging, and highs and lows of the season. This week on Home Impodcast…Adam and Jordan talk Alarmed by Burglars. Topics discussed include: Home Improvement, burglars, jokes, and being scared. The episode can be downloaded here. This week on Home Impodcast, Adam and Jordan have a conversation with Home Improvement writer/producer Billy Riback. The conversation touches on the early days of the show, writing jokes for Rodney Dangerfield, and what a reboot might look like. The episode is available here. Episode 124 is centered around Art Leonard in “Shopping Around.” In the episode, we talk about Home Improvement easter eggs as well as our memories of John Candy on the 25th anniversary of this passing. Listen now! Click here to support the show. This week, we check out “Mr. Wilson’s Opus.” Topics discussed include a ghost at Adam’s improv club, what vegetables we would be, and a Vulture interview on Richard Karn’s new role in PEN15. Please rate/review on iTunes or consider pledging to our Patreon to receive monthly bonus episodes and our undying love. This February, our Patreon bonus episode was centered around the ’90s Dan Aykroyd sitcom Soul Man. In our hour-long commentary, we delve into ways to improve the show, cast performances, and whether or not Home Improvement fans should watch the 25 episode run. Listen to a short preview of the bonus episode here. To get the full episode along with several other bonus episodes including our Last Man Standing special, support us on Patreon. On this week’s very special Home Impodcast, Adam and Jordan discuss The Longest Day. Topics discussed include: PEN15, parenting, and arcades. This week on the podcast, Adam and Jordan do a deep dive on Engine and a Haircut, Two Fights. Topics discussed include: an AMA with Debbe Dunning, bad titles, and haircuts. The episode can be downloaded here. Get into it! This week on Home Impodcast…Adam and Jordan hit the lanes with the aptly titled episode “The Bud Bowl.” Topics include: the net worth of the cast, Jordan hitting on girls, and basketball. This week on Home Impodcast, Adam and Jordan discuss the sleaziest Home Improvement episode to date, Eye on Tim. Topics discussed include: fan polls, ironing pants, and billiards. Don’t forget to rate and review the show on iTunes and/or donate to our Patreon page for additional content. This week on Home Impodcast, Adam and Jordan discuss When Harry Kept Dolores. Topics include: the 2019 Oscars, Alan Jackson, and books. In this Patreon-only preview, we are tackling “Tidying Up with Marie Kondo.” We discuss the possibility of a Home Improvement/Marie Kondo crossover and fan feedback among other things. Get the full episode at https://patreon.com/homeimpodcast. This week on Home Impodcast…we take to the skies with Fear of Flying. Topics discussed include: improv, ghost riding, and our wallets. This week on Home Impodcast…the boys get nuts with The Vasectomy One! Topics include: Tim Allen’s new website, forums, and the seven dwarfs. This week on the show…Adam and Jordan do their best to make Tanks for the Memories sound interesting. Ultimately, they fail just as the episode failed to funny and/or interesting. Come back next week as they try to right the ship. This is an excerpt from our monthly bonus episode on A Christmas Prince. Each month, we’re doing bonus episodes on, seemingly, random pieces of pop culture. For access to this and For Richer or Poorer, Last Man Standing, and Rush Hour episodes, pledge at least $1 a month to our Patreon. Part two of our I’ll Be Home For Christmas episode is available here. A thank you to YouTube Christmas music for the outro. This week on Home Impodcast…we tackle the JTT gem I’ll Be Home For Christmas. During part one of our discussion, we celebrate Home Impodcast Christmas with some gift giving and get into the plot of the film. Part 1 can be downloaded here. A special thanks to Christmas Instrumentals for our opening/closing music. This week on Home Impodcast…we’re talking High School Confidential. Topics discussed include a few HI-related articles, siblings, and Christmas movies. ALSO! We’re lowering the price on our Patreon tiers throughout the month. Donate a $1 per month to hear our bonus episodes. We really can’t make this any cheaper! This is an excerpt of our November patreon only episode on Rush Hour. Each month, we do bonus episodes on Home Improvement-adjacent projects…or like this one, just movies/shows we enjoy. Previous episodes include: For Richer or Poorer and Last Man Standing. Next month…we’re taking on Netflix’s A Christmas Prince. Wow! This week on Home Impodcast…Adam and Jordan talk Oh, Brother. Other topics include: Celeb salaries, mythology, and 5th grade love. Christmas came a little early on Home Impodcast! This week we’re talking ‘Twas the Flight Before Christmas. Topics discussed include: Tim Allen on Fallon, our Home Improvement gift engagement, and airport horror stories. This week on Home Impodcast…we’re talking That’s My Momma. Other topics include: Karnman’s Train cameo, the Toy Story 4 teaser, and familial traditions. This week on Home Impodcast…we sign in our name, fill out some paperwork, and read crappy magazines in preparation for “Doctor in the House.” We also discuss Home Improvement fan fiction and careers. This week on Home Impodcast, the guys talk Chicago Hope. Other topics include: the fall, Karaoke, and life in the big city! This week on the show, Adam and Jordan discuss Room Without a View. Other topics include: THR’s reboot poll, gators, and basements. This week on Home Impodcast, your esteemed co-hosts discuss The Look. Other topics include: life changes, Detroit Pistons mascots, and season tickets. This week on Home Impodcast things get a little spooky as the guys discuss Let Them Eat Cake. Other topics include: an HI-adjacent book, the introduction of a new character, and scary happenings. This is the second part of our interview with the one and only… Patricia Richardson. This week on the show…Adam and Jordan sat down with Patricia Richardson to discuss all things Jill and Home Improvement. Part one of two. This an excerpt from our hour-long episode of the LMS (reboot?) episode that debuted last month. For access to the whole thing, pledge $5 a month to our Patreon. Each month, we are doing Home Improvement-adjacent bonus episodes. In addition to these bonus episodes, those who donate will receive an exclusive sticker, access to bloopers, and a spot on our prestigious wall of fame. The clip can be accessed here. To donate and hear the whole thing, click here. This week on Home Impodcast…Adam and Jordan discuss Advise and Repent. They also get into a cool JTT website, fencing, and elitist ideals. This week on Home Impodcast…the dudes talk Jill’s Surprise Party. They also take a Home Improvement quiz and talk about books. It’s all very exciting. This week on Home Impodcast… the boys cover “Her Cheatin’ Mind.” They also discuss ice breakers, Serial season three, and books on tape. Episode 102 of Home Impodcast has the dudes talking “The First Temptation of Tim.” Topics include: a deep-dive of who Tim Allen follows on Twitter, Spiderman, and Bud Harper. To access the entire episode become a Patreon donor at the $5 level or higher. Next month’s bonus episode will tackle Last Man Standing. The season five premiere of Home Impodcast has those rowdy rascals watching “A Taylor Runs Through It.” Topics discussed include: the beauty of Michigan, Patreon, and the Detroit Lions. This week on the show, we’re going to into the depths of our Patreon vault with our special outtakes episode. These clips are pulled from the cutting room floor and have been spliced together for your pleasure. Warning, there are some swears in this one. This special announcement regards our updated Patreon account. Please listen and support the show to receive bonus content and swag. To celebrate their milestone 100th episode, the boys had a sit down with Home Improvement co-creator Carmen Finestra. During the interview, they discussed the origins of the show, what a reboot would look like, and the legacy of Home Improvement. On the 100th episode of Home Impodcast, Adam and Jordan discuss Wilson’s girlfriend. They also share some analytics, complete their season in summation, and get introspective about their run. Episode 99 has the dudes discussing A Marked Man. Other topics include: a Home Improvement diner, running away, and magazines! This week on Home Impodcast, the Binford Boys discuss “Sisters and Brothers.” They also delve into Adam’s living quarters, Gilmore Girls, and tea. This week on Home Impodcast, Adam and Jordan finish up the two-part episode “Tool Time After Dark.” Some might call it a train wreck, some might call it a masterpiece. Decide for yourself as they finish ranking the clips. This week on Home Impodcast, Adam and Jordan discuss part-one of Tool Time After Dark. They also talk vehicle maintenance and their rankings of the clips. This week on Home Impodcast, Adam and Jordan talk No, No, Godot. Other topics include: Tim Allen at Disney, scalping tickets, and the theater. The episode can be downloaded here. It is also available on iTunes. Our annual 4th of July episode is here! We’re chatting about Home Improvement‘s “Talk to Me.” We also cover topics like episode guest star Dave Chappelle (including this Vulture article), childhood chores, and Ed Helms in The Clapper (on Netflix). This week on Home Impodcast…things get a little steamy as we dissect The Naked Truth. Topics discussed include: an article about serial killers, cool suits, and bathing preferences. Random, right? This week on Home Impodcast, Adam and Jordan discuss “A House Divided.” They also talk about Father’s Day and take a firm stance of donuts. Topics discussed include: Richard Karn in Saint Charles, Last Man Standing, and birthday memories. This week’s show has the fellas talking Super Bowl Fever. Other topics discussed include: life changes, the big game, and SB snacks. Episode 88 – Brother, Can You Spare a Hot Rod? This week on Home Impodcast, the dudes talk Brother, Can You Spare a Hot Rod. Topics discussed include: Bowling, Jay Leno, and the late night circuit. On this week’s episode, Adam and Jordan talk The Route of All Evil. Other topics discussed include: Goodwill, the show’s first montage, and high school jobs. It’s Christmas in May on Home Impodcast as we fill our stockings with laughs! This week we’re talking Twas the Night Before Chaos. Topics discussed include: The Colonel, Matt “The Tool Man,” and Marvel movies. On this week’s show, we discuss Ye Olde Shoppe Teacher. Other topics include: two Home Improvement reboot articles, foreshadowing, and Toledo. On this week’s show, we discussed My Dinner with Wilson. Other topics included: Home Improvement memorabilia, Ecuador, and things we wish we could do. On this week’s show, Adam and Jordan talk Quibbling Siblings. They also delve into their recent meeting and films they’ve watched of late. In this special episode of the podcast, Adam and Jordan take a break from Tim Allen and go all in on Jonathan Taylor Thomas in Man of the House. They discuss mobsters in children’s movies, Richie Incognito and bullying, and our divisive finals thoughts. Listen to part two here. It is also accessible via iTunes. In this special episode of the podcast, Adam and Jordan take a break from Tim Allen and go all in on Jonathan Taylor Thomas in Man of the House. They discuss how the film treats PC culture of the ’90s, JTT’s sweet rollerblading skills, and Chevy Chase against the world. This is part one of a two-part episode, so stay tuned for the rest next week. Listen to part one here. This week on the show, your esteemed hosts discuss Let’s Go to the Videotape. They also get into the possibility of a Home Improvement reboot and get real about yo-yos. This week on the show, Adam and Jordan discuss the SPOOKY Borland Ambition. They also talk about the Oscars, Madonna, and Paul F. Tompkins. Episode 79 has the boys discussing “He Ain’t Heavy, He’s Just Irresponsible.” Topics discussed include: Jordan’s weekend misfires, Marty being the worst, and Adam’s complaints about bars on television. This week on Home Impodcast, Adam and Jordan get into the mess that is The Eyes Don’t Have It. Topics discussed include: the historical context of the date, the spoiler of a title, and eyeglasses! This week on Home Impodcast, Adam and Jordan give life to Death Begins at 40. They also pay tribute to Mickey Jones and discuss the possibility of going gray. This week on the show, Adam and Jordan break down the second episode of season four, Don’t Tell Momma. Other topics include: our upcoming meeting, Eddie the mechanic, and the meaning of life. This week on the show, Adam and Jordan kick off season four with Back in the Saddle Shoes Again. Topics discussed include: the podcast’s new theme song, Jill’s failure fundraising, and they introduce THE WILSONMETER. This week on the show, Adam and Jordan bring season three to a close with The Great Race II. After their discussion, they get into their favorite/least favorite parts of the season. Assuredly…it should not be missed. This week on Home Impodcast, Adam and Jordan talk Reality Bytes. Topics discussed include: A dope Decider article on Jill, great moments in wire history, and favorite planets. The guys are back this week, finally talking about an episode of Home Improvement. This week they cover What You See Is What You Get. Topics discussed include: what they did during the hiatus, Gameboy memories, and garage sale finds. This week’s episode is sponsored by Crunch Time Cam. Crunch Time Cam is a children’s sports novel about teamwork, family, and friendship. It’s a must have for fans of Home Impodcast. This week, Adam and Jordan bring in the New Year with yet another Tim Allen Christmas movie, El Camino Christmas. In this brisk overview, they discuss what they liked and disliked about the Netflix original. Next week, they will be back to Home Improvement. In part two of this two-parter (Part 1 here), Adam and Jordan finish off The Santa Clause 2. Topics discussed include: the incredibly sloppy ending, the MVP/LVP, and how to fix the film. Merry Christmas/Happy Holidays to all listeners! This week on the show, Adam and Jordan discuss Swing Time. Topics discussed include: Tim Allen’s appearance on the Norm McDonald show, rap names, and cool tv houses. This week on Home Impodcast, we watched Fifth Anniversary. It wasn’t very good, but our discussion ruled! We also talked about the Hulu documentary “Too Funny Fail,” our favorite meats, and our upcoming episode on The Santa Clause 2. This week on Home Impodcast, Adam and Jordan dive into a special Thanksgiving episode – Tim Allen’s film Jungle 2 Jungle. This episode was so massive, we couldn’t contain it in one episode. Catch Part 2 next week! On our 69th episode of the podcast, we talked It Was the Best of Tims, It Was the Worst of Tims. Topics include: the ironic sexuality of this particular episode, breakfast foods, and we announce the winner of our giveaway! This week on Home Impodcast, Adam and Jordan talk Too Many Cooks. Other topics include: a Home Improvement-related ride at Disney World, nods, and our favorite cooking shows. On our episode about Home Improvement’s The Eve of Construction, your favorite podcast hosts discuss Randy’s future as a jeweler and Jimmy Carter saving the day. On this week’s show, Adam and Jordan talk Room for Change. Other discussions include: fall happenings, sharing a room, and our early memories of cell phones. Thank you to our episode sponsor, Audible. Get your 30-day free trial and free audiobook today! This week on the show, Adam and Jordan talk about The Colonel. Other topics discussed include the awesome giveaway, M. Emmett Walsh, and Jill’s inability to talk to her parents. It’s pretty stellar. Thanks to this episode’s sponsor Stuck in the 90s podcast. Check out their show! This week on the show, Adam and Jordan discuss Reel Men. They also talk Home Improvement on Hulu, family heirlooms, and Adam has some issues with the depiction of ice fishing in the episode. Don’t forget about our ongoing giveaway! Leave us a review on iTunes and/or donate to the show and you could win an autographed copy of Tim Allen’s “Don’t Stand too Close to a Naked Man.” It’s autographed by us…not Tim. Shout out to this episode’s sponsor That’s So 90’s Podcast. Make sure to check out the show! On this week’s show, Adam and Jordan discuss episode 63 of Home Improvement, “Dream On.” They also talk about a new giveaway and their own reoccurring dreams. The episode is available for download here. It can also be accessed via iTunes. This week on Home Impodcast, we discussed Slip Sleddin’ Away. Other discussions include: the purchase of a Home Improvement board game, Jordan’s height, and a missing Mark Taylor. It’s Christmastime on Home Impodcast as Adam and Jordan discuss ‘Twas the Blight Before Christmas. Talking points include: Adam making soup, Brad playing sax, and favorite Christmas songs. This week on the show, Adam and Jordan discuss A Frozen Moment. Talking points include: a Game of Thrones party, Christmas cards, and toilet seats. On this week’s show, the boys try to make sense of Dollars and Sense. Topics include: Adam meeting Eddie Munster, sports memorabilia, and heights. This week on the show, Adam and Jordan discuss Be True to Your Tool. They also go through some ratings and reviews for the show, discuss bad fennel jokes, and talk about where they get groceries. This week on Home Impodcast, Adam and Jordan discuss Blow Up. They also talk tuna, Aaron Carter, and The Nut Job Two. This week on Home Impodcast, your humble hosts (and Dracula) discuss “Crazy for You.” They also talk about Home Improvement kind of seeming scary and various Halloween traditions. This week on the show, Adam and Jordan take on “Arrivederci, Binford.” Other topics include foreign languages, Tim’s sculpting ability, and the confusing entity known as Mr. Binford. This week on the show, Adam and Jordan discuss “A Sew, Sew Evening.” Other topics include: acting, middle school elective classes, and eating too much food. This week on Home Impodcast– Adam and Jordan discuss episode 52 of the series. Other topics include: Budweiser commercials, nicknames, and being rebellious. This week on Home Impodcast, Adam and Jordan dissect the second episode of season three…Aisle See You in My Dreams. They also detail their hot takes on fishing and celebrity encounters they’ve had. The 50th episode of Home Impodcast has Jordan and Adam talking Maybe, Baby. They also celebrate their tremendous milestone with a story about the time Adam met Zachary Ty Bryan and bring in a special guest to corroborate his story. This week on Home Impodcast: Adam and Jordan interview RICHARD KARN! Topics discussed include: the origins of the Al character, if Richard caused the lumber-sexual movement, and a possible Home Improvement reboot. If ever there was an episode to listen to…this is it. Please rate and review us on iTunes if you haven’t done so and support the show, so that we can continue to record stellar episodes like this one. Episode 49 has Adam and Jordan talking about the final episode of season two, The Great Race. The fellas also talk about the season as a whole and answer some listener questions. Episode 48 has Adam and Jordan celebrating the Birth of a Hot Rod! Other topics discussed include: the NBA finals, favorite cereals, and barnyard fun. This week on Home Impodcast, Adam and Jordan “breakdown” season two’s To Build or Not to Build. They also discuss magic, Adam does some spoken word poetry, and they celebrate their one year anniversary. This week Adam and Jordan discuss Ex Marks the Spot. Other topics include: Schwarzenegger’s The 6th Day, boy scouts, and what the dudes would change their names to, if given the choice. On this week’s show, Adam and Jordan get a ‘lil silly as they work their way through Much Ado About Nana. Topics discussed include: the cancellation of Last Man Standing, Jill acting like a child, and Guardians of the Galaxy: Volume Two. On this week’s episode, Adam and Jordan talk Shooting Three to Make Tutu. Topics discussed include a new Tim Allen project heading to Netflix, computer crashes, and COOKIES! This week, Adam and Jordan talk Karate or Not, Here I come. They also discuss miniature golf, the appeal of karate, and skipping school. This week on Home Impodcast–Adam and Jordan discuss Bye Bye Birdie! They also talk Easter, morning television, and bring back some WIS-TIM. On this week’s episode, Adam and Jordan discuss the diaper load that is You’re Driving Me Crazy, You’re Driving Me Nuts. Additional discussions include: Easter, babysitters, and automobiles. On this week’s installment of the show, Adam and Jordan discuss Dances with Tools. Other conversational points include: real-life Quidditch, the boys playing weird pranks, and television shows we’re currently watching. In one of their longest episodes to date, Adam and Jordan talk dummies and divorce in Love is a Many Splintered Thing. Topics discussed include: the start of baseball season, Adam impersonating Elvis, and the guys take their own compatibility test. Don’t miss this one! On this week’s episode– Adam and Jordan discuss the current state of their lives, joint-bank accounts, and Randy killing it. After a week away, Adam and Jordan return with the ever-trippy, Bell Bottom Blues. Topics discussed include: Box city, belt collections, and whether or not Patricia Richardson knows she’s on a TV show. We apologize for the lackluster sound quality this week. We are doing everything we can to improve it. On this week’s episode, Adam and Jordan take a look at their second Home Improvement-Christmas episode. Other talking points include: the death the IMDB message boards, adolescent cons, and volunteering! The episode can be downloaded here. It is also available via iTunes. 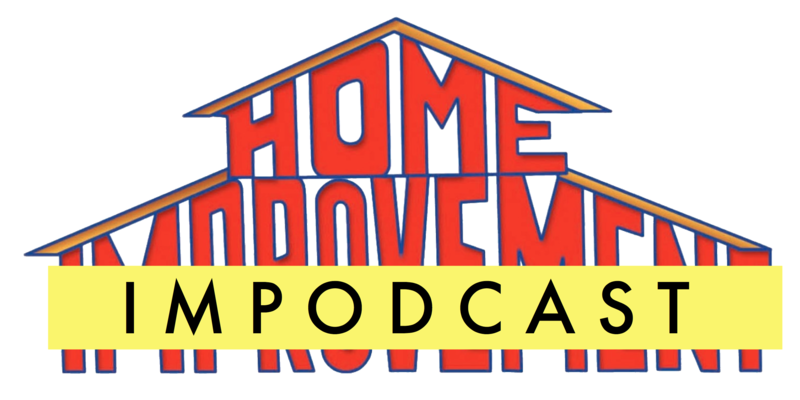 On this installment of Home Impodcast, Adam and Jordan introduce the Home Improvement trade deadline bonanza, talk about Jill’s insanity, and note some interesting life-hacks. On this week’s show, Adam and Jordan talk Let’s Did Lunch. They also reference some very topical H.I. news, Randy’s cool line delivery, and RANDOM shows they’ve binged. They also talk about a cool online map, the final Wis-Tim from book two, and skydiving. Episode 32 of the podcast has da fellas analyzing “May the Best Man Win.” Topics broached include: top five television shows, parrots in need of lawyers, and go-to jokes. This week on the podcast, Adam and Jordan dissect the (rotten) Roomie for Improvement. They also talk about a change in studios, chicken pox, and racing. Episode 30 of Home Impodcast has the dudes discussing “Haunting of a Taylor House.” They also talk movies, Rider Strong, and what type of candy each cast member would be. Count Dracula also stops in to help Adam with his bit of Wis-Tim. On this installment of Home Impodcast, Adam and Jordan take on “Heavy Meddle.” They also dive into the IMDB message boards and share their favorite board games. After a holiday hiatus, the dudes are back to talk the 4th episode of season two: Groin Pains. Topics discussed include: encyclopedias, painful injuries, and New Year’s resolutions. The episode is available here. It can also be accessed on iTunes. Please rate/review us while you’re there. If you dig our vibe then please support us! Chestnuts roasting on an open fire, Jack Frost nipping at your nose, and Adam and Jordan discussing the Tim Allen holiday hit, “The Santa Clause.” What more could you ask for? In this elongated ep, the boys talk about the timeless nature of the film, ask some logistical questions, and discuss what they want for Christmas. If you’re wondering what to get us for the holiday…our pledge drive is still accepting donations and you can always rate and review us on iTunes. This week on Home Impodcast–Overactive Glance! Topics covered include: Indian food, bad haircuts, and fumbles vs. incomplete passes. The episode is available for downloaded here. It is also on iTunes. Technically speaking, with this episode we encountered some technical difficulties. Nevertheless, episode 26 on “Rites and Wrongs of Passage” is here and we still think you’ll like it. When we’re not talking Tim–we’re getting heavy with topics related to: the Pontiac Silverdome, folder preferences, adolescent punishments, and MONSTER TRUCKS! For the first episode of the second season, dem’ boys cover “Read My Hips.” They also introduce their new theme song, talk about Jordan’s birthday, and perform a visual analysis on the show’s new opening sequence. This week’s show is sponsored by Stacy Castle. If you want to be dope like Stacy then click here! In this installment of Home Impodcast, the guys talk about the highs and lows of season one and celebrate making it through the first 24 episodes of Home Improvement. They also discuss season two changes and ways to support the ‘cast. This week’s episode covers the finale of the first season. In addition to their analysis on “Stereo-typical,” the boys talk about a scholarly Tim Allen blog post, songs that make them cry, the bizarre concept of time on Home Improvement, and a duck statue that Jordan dresses up like Sherlock Holmes. The fellas also introduce their pledge drive and talk about ways to donate to the show. They have goals and are offering rewards to those who give. Additional information can be found on the web page. In their 23rd episode, Adam and Jordan discuss “Al’s Fair in Love and War.” They also talk young love, seasons, and how old Brad is (again). On the 22nd episode of Home Impodcast, Adam and Jordan hedge their bets with Luck Be a Taylor Tonight. They also talk about the weird domestic abuse-ish subplot and Jordan playing a lot of cards. It’s an episode that cannot and should not be missed. Episode 21 comes in and your hosts agree – it’s the worst written episode to date. Adam and Jordan also chat about the NBA season tip off, their favorite Halloween costumes, and Tim Allen turning down ABC’s Dancing with the Stars. For the 20th episode of Home Impodcast, Adam and Jordan (eventually) discuss “Birds of a Feather Flock to Taylor.” In addition to that mouth-full, the dudes talk fave films, introduce a new (ish) segment, and have too many asides to count. This week on Home Impodcast, the podcast’s own righteous brothers provide their thoughts on the mediocre “Unchained Malady.” In addition to that–they discuss a Buzzfeed article, superstition, and buffets. It’s a real knockout! Episode 18 has the dudes talking “Baby It’s Cold Outside.” In addition to their biting commentary–they also reference Rolling Stone’s Top 100 TV Shows List, home movies, realistic sets, and camping! Episode 17 – What About Bob? Episode 17 of the podcast breaks down the highest rate IMDB episode of season one, “What About Bob?” The guys also discuss Jordan’s love for a show called Kid Nation, Bob Vila’s acting, and Jordan vaguely notes that he used to be mean to this one kid. Please rate/review us on iTunes, if you have not already done so. On episode 16 of Home Impodcast, Adam and Jordan discuss the puzzling “Jill’s Birthday.” They ponder whether or not it is acceptable to forget a significant other’s bday, go behind the scenes with an article from Mental Floss, and discuss waist sizes. We also find out what game show they consider to be “hands down” the best. On episode 15 of Home Impodcast, Adam and Jordan breakdown (what they can of) “Forever Jung.” The fellas also discuss food trucks, a strange Tim Allen-inspired message board, dancing, the occult…and they even get a little sentimental. Also, JENNIFER SUDARKSY IN THE HOUSE! This week on Home Impodcast, Adam and Jordan discuss the hidden gem that is “For Whom The Belch Tolls.” In the episode — the fellas talk football, friendship, and Christopher McDonald’s stellar performance. Perhaps, one of their better efforts to date, or perhaps not. You be the judge. The 13th episode of Home Impodcast is here! Adam and Jordan strike up some conversation about Home Improvement’s “Up Your Alley” episode. They also discuss their own bowling prowesses and the never ending quest for memorabilia. Ho-Ho-Home Impodcast is back with the 12th episode of season one, “Yule Better Watch Out.” In this Christmas-infused podcast, your hosts discuss: RAD robot, Jordan’s (infamous) turn as Santa in the school play, message board posts, and they answer some listener mail. On our eleventh episode, we do our own public speaking while Jill struggles with it, mightily, in “Look Who’s Not Talking.” Also, Tim and Mark dress as women and laughs ensue! Topics include: a poorly written article on teenage hunks, fathers, milkshakes, and Jordan’s insecurities. On their “Aluminum Episode” of the podcast, Adam and Jordan look at episode ten of the series, “Reach Out and Touch Someone.” In their discussion, they talk about an unlikeable Tim, sewing your own pants, and struggles in academia. They also may or may not give themselves a hearty congratulations on reaching the 10 episode mark. 192 to go! The episode is available for download here. It can also be found on iTunes. Happy hump-day, Home Improvement fans! On this week’s podcast– we dip our feet into the lukewarm bath that is episode nine of the series, entitled “Bubble, Bubble, Toil, and Trouble.” We also discuss the Olympics, a listicle featuring Home Improvement, crown molding, and the Olsen Twins. On the eighth episode of Home Impodcast, Adam and Jordan put the eighth episode (no coincidence) of the series, “Flying Sauces,” under the microscope and it does not disappoint! Topics discussed include: Tim Allen on Fallon, sibling pranks, bathrobes, and the possible existence of aliens and the extraterrestrial. Click here to download. The episode of also available on iTunes. Hump day is upon us, which can only mean one thing– a new edition of Home Impodcast. On this week’s show, Adam and Jordan talk “Nothing More Than Feelings,” the seventh episode of the production run. Perhaps the most humorous 22 minutes the series has boasted thus far… or perhaps not. The two also discuss celebrity circus shows, crying during sporting events, and what pieces of literature they’ve read of late. Entertainment Weekly has called “Nothing More Than Feelings” one of their best episodes to date. Click here to download. The episode is also available on iTunes. On this week’s installment of Home Impodcast, Adam and Jordan dissect the sixth episode of the production run — Adventures in Fine Dining. They also discuss an archaic/enjoyable Home Improvement fan site, what’s in a name, and their own experiences in fine dining.